« # 25 New Roman Times-Camper Van Beethoven. Part 1 The Republic of California vs The Republic of Texas. #26- New Roman Times Album- Camper Van Beethoven Pt 2. Last Post i put up my beautifully annotated map and never really explained it’s significance. Let me explain the map and the backstory to New Roman Times. This backstory was created by Jonathan Segel and I over a couple of weeks via email exchanges. As a counterpoint to the Red State/Blue State theme We divided North America up into 13 distinct Nations. So North America looks more like south America. We did this based on our experiences touring. Calgary with it’s cowboy heritage and country music; Edmonton with it’s oil patch politics seemed part ofTexas. Greater Texas if you will. The western half of South Dakota, for similar reasons is part of Greater Texaas. Half of South Dakota is green farms, restaurants advertising Swedish Meatballs and polka nights. The Sunday sermons listed on the Lutheran Churches seem fairly pragmatic and don’t suggest any snake handling is going on inside. But you cross the Missouri river and it’s range land, cowboys and off- brand evangelical churches in old storefronts. Their signs scream “Repent Sinners”. You also get weird billboards urging the US to leave the UN cause it’s part of the Anti-Christ’s plan for one world government. So therefore Texas includes all the high plains and front range grasslands. All the way up to Canada’s arctic oil patch. Texas also includes the other North American oil patches in west texas, Louisiana, and the Mexican gulf coast down to Veracruz.. And a good bit of the Commanche, Apache and Navajo Country. The latter as part of the semi-autonomous Aztlan. 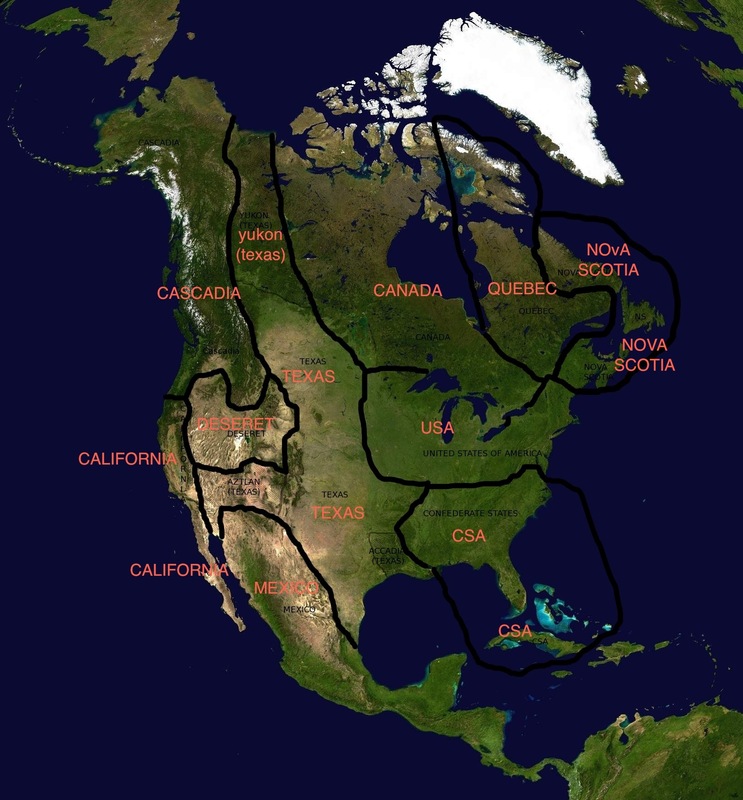 Similarly Louisiana (Acadia ) is semi autonomous as well as parts of the Yukon and Canadian arctic. Texas is the most powerful nation in North America. It is the only Country with access to the Atlantic, Pacific and Arctic Oceans. It also controls most of the oil and gas resources of North America. Texas is closely allied with Deseret the Mormon nation which occupies much of the Great Basin of the intermountain west. It is also closely allied with The Confederate States of America. The Confederate States of North America are occupy the exact area that you imagine they would. Except they’ve managed to annex Cuba, The Bahamas and other islands in the Caribbean. Maritime Canada is it’s own nation Nova Scotia. This seemed to make sense to us as Maritme Canada seems much culturally closer to Scotland, Ireland or England. And few Americans realize that Labrador and Newfoundland were not part of Canada until the late 1940’s. Quebec is where you would imagine. The United States is basically everything above the mason Dixon line and East of the Missouri river. There are a couple of notable exceptions: Maryland, Delaware, West Virginia, Franklin ( a new state formed by union loyalists in Eastern TN and Western NC) Kentucky, Missouri parts of Northern Arkansas, Washington DC and northern Virginia north of the Rappahanock river are all part of the United states. 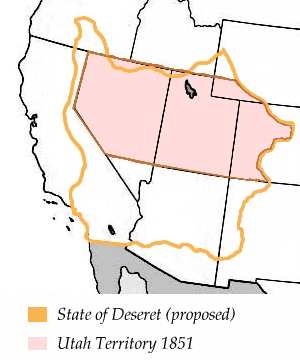 In Reality Reality This was the Proposed State of Deseret. Texas then encouraged the Mormons in parts of the Northwest to rebel against the British and establish their own polygamous nation. Texas also allowed Mormon areas of Utah, Nevada, Wyoming and eastern Oregon to secede and join the Mormon state. Earlier Texas had wrested much of this area from Mexico in the second Texan-Mexican War of 1845. At this time Texas also helped California (including Baja California) break away from Mexico. California at first was a virtual colony of Texas. But as many Union loyalist from the Northwest, Deseret and Plains filtered into California it became more and more independent. This division between the chiefly Texan Confederate and Mormon settlers in the sparsely populated and impoverished Southern California and the wealthy Union loyalists in the North would come back to haunt California. Indeed this is how our story begins. In 2004 parts of Southern California try to Secede from the Republic of California and a civil war ensues. The Republic of Texas and The Mormon republic Deseret opportunistically intervene on the side of the Southerners. Deseret hopes to expand their borders to include the large mormon communities in the Las Vegas and San Bernadino Provinces of California. The Texans gain control the Pacific ports at Ensenada and San Diego. This is important because previously their Pacific Fleet was based out of Rocky Point or Puerto Penasco on the bay of California in the semi-autonomous Aztlan region of Texas. Mexico and California could effectively “bottle up” the Texan fleet in the Bay of California. And also about this time It is revealed that two distinct Space Alien races have established secret bases in the California. The “Blues” in Baja California near Loreto. And the “Greys” just outside of Las Vegas. At area 51. The Blues and the Greys who had taken a hands off approach to Earthling politics up to this point intervene to enforce a truce on the two warring sides. The conflict becomes a simmering insurgency. The northern Insurgents call themselves The CVB. No one is sure exactly what the acronym stands for. There is also this new genetically altered weed that is floating around. It actually increases ones intelligence and it may have come from the aliens. It may also explain Californias sudden technological advances. It’s called Flower in English or Chocolate in Spanish. It’s distribution is controlled by a Mexican gang (Los Tigres Trafficantes) operating with the complicity of the Mexican intelligence services. See my post on Jo stalins Cadillac for the Camper Van Beethoven patented songwriting formula. But I believe we have the three main elements. Seems like a Camper Van Beethoven Album to me. In reality Jonathan recorded this guy selling chocolate on a street corner in Lima Peru. He chopped it up and put it to this instrumental. The young Texan Soldier is now working for Texintelsecuricorp. A private intelligence company in Texas. He’s supposed to be gathering intelligence on the CVB and Mexican operatives in Southern California but he’s really just spending most of his time smoking Flower with Los Tigres Trafficantes. Also TexIntelSecuriCorp is none as a “Doo Dah” in other words it has the same cadence as “Camptown Races five miles long”. Frank Funaro Cracker’s drummer can hear any instance of this cadence. He quickly says “Doo Dah”. I was singing practicing pronouncing TexIntelSecuirCorp when Frank Funaro shouted across the room “Doo Dah”. In part three I will do the songs and the story chronologically. This entry was posted on August 12, 2010 at 6:18 pm and is filed under Camper Van Beethoven with tags i am talking to this flower, Los Tigres Trafficante. You can follow any responses to this entry through the RSS 2.0 feed. You can leave a response, or trackback from your own site. It’s starting to make better sense to me. All this time I heard NRT was a concept album but simply thought myself either too stupid or too ill-informed in conspiracy theory to understand it. The “concept” now appears much more intermediate than I initially thought. The more I read of this blog, the more illuminated the New Roman Times idea and story get. Thanks, David, for clearing this up. It’s a comic and I know that’s frowned upon in some quarters, but not by me. Anyway it’s the New York version of your map of Texas etc. Kudos on the East TN trivia. There is a little-known piece of wartime drama based on the tragic tale of the few anti-sesesh NorCal holdout forces from L.A. They fled to Catalina, where the Texans pursued them with extreme prejudice, chasing them all the way to Santa Cruz Island off Santa Barbara. There they held out briefly, spurred on by ghostly visions of Juan Rodriguez Cabrillo and the notorious Frank Weelykta. Supposedly (i.e. the “official story”), the NorCal auxiliaries died to the last man while engaging in their Charge Of The Weird Brigade, succumbing to superior, remorseless, and overwhelming Texas Marine units. Santa Cruz, Santa Rosa, and Anacapa islands endured so much damage that eventually they sank—but living eyewitnesses insist that Grey alien ships spirited away the Channel Islands and their steadfast inhabitants at the last minute. The holdouts were transported en masse to Strom Thurmond City, Mars—which they promptly renamed “Zinntopia” after deftly infiltrating the Martian zoning boards and homeowner associations—and lived there ever after, nursing the ancient anti-Texan grudge and feverishly developing their own methods of outer space travel using volatile combinations of LSD and Martian fungi. There are a band of Jack Mormons acting as guerilla insurgents in the State of Deseret you know. We lie all along the trails between Park City and Monroe. So maybe if there’s a sequel we can get a song or something. If I read the map correctly, the Inland Empire is part of the great state of Texas. Woohoo. Means I wouldn’t have to leave the state in order to attend the annual campout. I’m ready for the Big Time! I don’t know if I’m the only one who can claim this distinction, but for the last year and a half or so, I’ve put my two year old son to bed while humming the melody to “Los Tigres Traficantes.” I’ll pick him up, and as soon as he hears that first perfect fouth interval, his head goes straight down on my shoulder. This song makes me happy. wow, references to both pragmatic Lutherans and The Lost State of Franklin in the same blog. You sir, are truly a genius of useless stuff. Before I moved to the Maritimes, I thought Newfoundland was part of the Maritimes. I’ve learned to never say that! since as you mention, Newfoundland did not join Canada until 1949. Many Newfoundlanders still consider that to have been the island’s downfall. This future grouping reflects the historical extent of Nova Scotia which encompassed modern-day New Brunswick, back when those loyal to the British crown (and the slaves they tricked) fled the American war of independence for these rocky shores. which also divides up the entire nation in a similar way that David and Jonathan did here.